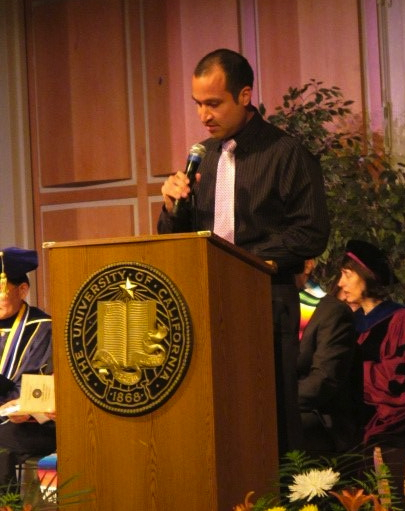 Next Tuesday, Angel (Christopher) Ramirez ('06) will talk of his success as adjunct faculty. Christopher Ramirez lives in Merced, California; the first to attend college in his family, he acknowledges the many hardships minority students face to graduate; be it high school or college. Growing up in a working class home, Ramirez saw higher education as a vehicle for self-discovery and upward mobility. But he knew it would take more than just him to accomplish academic success. His first role model, Riverside Community College English Professor Jan Kollitz, instilled in him the importance of writing; which stimulated him to search for the creative aspects of his life. His DANM MFA project, retitled Color Bonita, went on to several festivals and universities across America, including OUTFEST and Performing The World In NYC. Christopher now dedicates his time and energy to helping others discover their own unique voices. For one, he teaches writing at the University of California, Merced, where he takes pride in educating first-generation college students. In addition to his teaching responsibilities, Christopher fosters community partnerships by engaging service learning opportunities with UC Merced’s Office of Student Life and his current writing classes. His own enthusiasm for service extends into Chancellor Dorothy Leland’s Campus Climate, Culture and Inclusion Committee. Christopher is also one of two elected Building Healthy Communities Hub-Steering Committee Members for South Merced; he also serves as Chair for the Community Grant Subcommittee. Ramirez also dedicates time to building leadership skills. Last June, he became a graduate of Leadership Merced,The Greater Merced Chamber of Commerce’s one-year leadership program. Other leadership programs include: UC Merced’s MOSIAC (Maximizing Opportunities for Social Awareness, Inclusion and Community), and LDIR (Leadership Development in Interethnic Relations). He views leadership as integral to creating healthy communities and relationships. For more than two years now, Christopher has collaborated with the District Attorney’s office, Merced County Office of Education, and other community groups to create Merced County Project 10%, a program focused on decreasing high school dropout rates locally in Merced County. The objective: to cultivate belief in a brighter future by promoting the importance of graduation to all middle school children. Christopher envisions other vital opportunities, which promote the well being of our youth: ensuring them a life that is free from violence and compromised health.